'Cane Hill Barn with Peach Tree' (2016, Watercolor, 60 inches by 60 inches) is part of the exhibition George Dombek: Barns and Portraits, which opens Jan. 17 in Vol Walker Hall. FAYETTEVILLE, Ark. – The exhibition George Dombek: Barns and Portraits is on display Tuesday, Jan. 17, through March 17 in the Fred and Mary Smith Exhibition Gallery in Vol Walker Hall on the University of Arkansas campus. An opening reception will be held at 5 p.m. Friday, Jan. 20. The exhibition explores the creative work of Dombek, found in the new book Barns and Portrait Paintings. 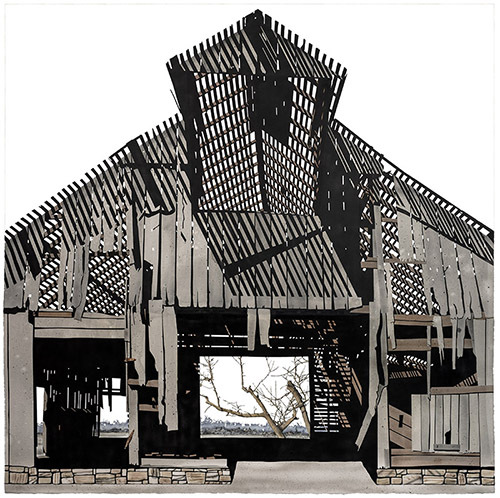 The book, published by the University of Arkansas Press in collaboration with the Fay Jones School of Architecture and Design, features Dombek's paintings of barns from across Arkansas, as well as his "portrait" paintings of found objects such as rusting metal pipes, tin cans, tractor parts and farm implements. Dombek will be signing copies of his book at the Jan. 20 reception. Dombek received a Bachelor of Architecture and Master of Fine Arts in painting from the University of Arkansas, in his birth state, and went on to teach art and architecture at universities in Arkansas, Ohio, Florida, Saudi Arabia and Italy. He never lost his passion for watercolor, however, generating an impressive catalog of work, which has been exhibited in more than 600 private, corporate and museum collections and in more than 100 exhibitions, including the Arkansas Arts Center, Scottsdale Center for the Arts, Birmingham Museum of Art, Carnegie Museum of Art, Butler Institute of American Art, San Francisco Museum of Art and Crystal Bridges Museum of American Art. Among his more than 80 awards is recognition from the Southern Arts Foundation, the National Endowment for the Arts Regional Visual Arts Fellowship, the Florida Arts Fellowship, the Marie Walsh Sharpe Art Foundation, and the Pollock-Krasner Foundation.